There is just no getting around the fact that Snapper builds a great tractor. This company has been in business for a long time, and continues to produce top of the line products for a variety of consumer needs. Snapper began manufacturing lawn tractors in the 1950’s. The Snapper product line is both extensive and impressive in scope. Starting with a mid range priced model, the line extends into the very best lawn and garden tractors available. Most Snapper lawn tractors feature the ‘3 in 1’ option,allowing for side discharge, mulch,or rear bagging. The deck cutting height is adjusted manually using a lever. The front axles on all Snapper tractors is fabricated of cast iron. This is the sturdiest material available for a lawn tractor front axle. The deck design on all the Snapper lawn tractors feature the ‘step through’ design. This eliminates any obstructions in front of the drivers seat. This allows for easy entry and exit from the tractor without the need to lift feet and legs over a raised portion of the frame. 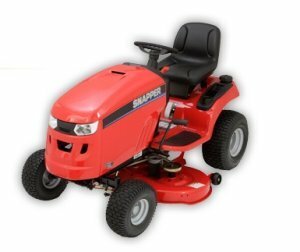 Snapper lawn tractors are available in 2 broad categories - lawn tractors ( designated “LT”) and Garden tractors ( designated “GT”). The LT models are numerous, and include 6 categories including the LT 100, LT 125, LT 130, LT 200, LT 300, and LT 400. There are 2 GT models available - the GT 500 and GT 600. The LT series offers a choice between a single cylinder Briggs and Stratton 18.5 HP single cylinder engine; twin cylinder Briggs and Stratton twin cylinder engines ( 20, 23, or 24 HP) or a Kohler twin cylinder 25 HP engine. All engines except for the 18.5 HP feature a pressurized oil system, with a replaceable oil filter. The lower priced models In the LT series have a manual PTO used to engage the cutting blades. Most have an electric PTO, however. The LT100 series offers 2 different models, both equipped with either a 23 or 24 HP Briggs and Stratton twin cylinder engine. The engines features a pressurized oil system, with a replaceable oil filter. The transmission is hydrostatic, with foot pedal controls. The 46” or 52” cutting deck feature efficient triple blades, which are powered by an electric PTO that is engaged by flipping a switch. Count on spending between $2000.00 to $2100.00 for the tractors in the LT 100 series. The LT 125 series offers the same choice between a 23 or 24 HP Briggs and Stratton twin cylinder engine. Both versions of the engine feature a pressurized oil system, with a replaceable oil filter. The 42” or 46” cutting deck features double blades, which are powered by an electric PTO that is engaged by flipping a switch. The price? Between $2000.00 to $2200.00 for the tractors in the LT 125 series. The LT130 series is offered as a single model, and comes equipped by a powerful 23 HP Briggs and Stratton twin cylinder engine. This engine features a pressurized oil system, with a replaceable oil filter. This model has an electric PTO, which is engaged by flipping a switch. The cutting deck width is 46” (triple blades). The LT200 series offers 4 different models. Engine options range from a single cylinder 18.5 HP side valve single cylinder Briggs and Stratton engine, to a 20 or 22 HP twin cylinder Briggs and Stratton engine. The twin cylinder engines features a pressurized oil system, with a replaceable oil filter. The 18.5 HP engine had a traditional oil splash system, which has been used for decades.The transmission is hydrostatic, with cruise control. A variety of cutting decks are available, including 38”, 42”, 44”, or 50”. The two larger deck sizes feature triple blades. Count on spending between $2200.00 to $3000.00 for the tractors in the LT 200 series. The LT 300 series offers a 20 HP Briggs and Stratton twin cylinder engine on the solitary mower in this series. This engine features a pressurized oil system, with a replaceable oil filter. The 44” cutting deck features triple blades, which are powered by an electric PTO that is engaged by flipping a switch. The deck is easy to remove using the “Quick Hitch” removal system. The price? It will cost about $4500.00 to park this sweet machine in your garage. Next is the YT 400 tractor . Sporting a 23 HP Briggs and Stratton twin cylinder engine, this is a tractor ready for anything a homeowner can throw at it. This engine features a pressurized oil system, with a replaceable oil filter. The heavy duty hydrostatic transmission sports a controlled traction differential that helps prevent the rear wheels from spinning in slippery conditions. The hefty 50” cutting deck features triple blades, which are powered by an electric PTO that is engaged by flipping a switch. The deck is easy to remove using the “Quick Hitch” removal system. Count on spending about $4500.00 to drive this ultimate lawn tractor across the yard. Now for the GT 500 series . Since this is considered a garden tractor, features ( and price) are more abundant. This beauty is powered by a 25 HP overhead valve (OHV) Kohler engine. The heavy duty hydrostatic transmission sports a controlled traction differential that helps prevent the rear wheels from spinning in slippery conditions. Cruise control is standard. An electric PTO is engaged by flipping a switch. The cutting deck width is 54", featuring triple blades for added efficiency. The deck height is adjusted by a hydraulic mechanism, with fingertip controls. This kind of machine is not a cheap date. Plan on spending about $7600.00. Now for the GT 600 series - the ultimate tractor made by Snapper. Since this is considered a garden tractor, features ( and price) are more abundant. This behemoth is powered by a 27 HP three cylinder Briggs and Stratton diesel engine. The heavy duty hydrostatic transmission sports a controlled traction differential that helps prevent the rear wheels from spinning in slippery conditions. Cruise control is standard ( of course). The addition of a hydraulic 4 way joystick attachment lift brings tis machine to the ultimate in accessories, to include a post hole digger, rear grading blade, and a rear rotary field mower. For most of us, the price of $12,000.00 ( for the tractor only) makes this a mower that will remain forever in our dreams ( and not in the garage). Most customers that buy a Snapper lawn tractor buy another in the future, based on high satisfaction and innovative engineering of the product.